The Eagles dealt wide receiver Torrey Smith to the Carolina Panthers on Friday in exchange for cornerback Daryl Worley. From Jeffrey Lurie to the coaches, his Philadelphia Eagles teammates and the Lincoln Financial Field janitors, Torrey Smith thanked just about everyone on his way out on Friday. Smith, 29, thanked Eagles owner Lurie, several of his coaches and teammates as well as a slew of others in an Instagram post on Friday night, hours after reports circulated that he had been traded to the Carolina Panthers in exchange for cornerback Daryl Worley. The trade, the team's second of the week, comes a little more than a month after Smith helped the Eagles cap off their first Super Bowl title. "WHAT A YEAR! We played for each other and because of that we will fly high together forever!" Smith wrote, addressing his now-former teammates. "I have never had this much fun playing this game that we all love and it was all because of y’all. We had a great time, worked our tails off, and made each other better." Although he didn't specifically mention coach Doug Pederson or vice president of football operations Howie Roseman by name, Smith covered nearly everything else. 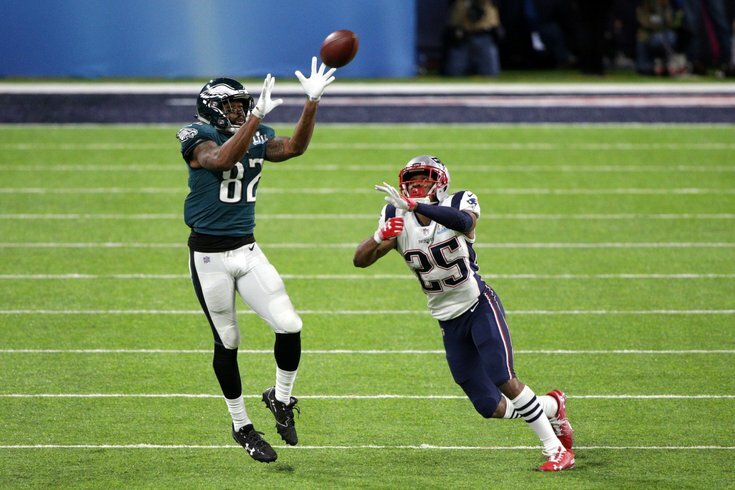 "I would like to thank the entire Philadelphia Eagles organization for the opportunity to represent this city," said Smith, who added a deep threat to the Eagles' wide receiving corps when he signed with the team before last season. "Mr. Lurie thank you for being the man that you are and genuinely caring about your players and the people of the city. To all of the coaching staff, Thank you!" Smith mentioned Mike Groh, who worked as the team's wide receivers coach last season before being promoted to offensive coordinator for 2018 after Frank Reich's departure. He also thanked player personnel staff members Joe Douglas and Andy Weidl "for believing in me since day one and treating me like family. We are family forever." Even longtime media personality Howard Eskin got a shoutout. "I will miss G and the equipment staff, Pat and the video crew, strength coaches, trainers, pr team, SOME media folks (Someone tell Howard that Lebron is the GOAT), community relations staff, chefs, and janitors. I appreciate your friendship," Smith wrote. He finally thanked the city for embracing him and his family last season. "I look forward to visiting my family in PA for the rest of my life knowing that WE did it! They can’t take that away from us!" he wrote. "I have grown so much in my faith over the last year because of the men in that locker room. I will miss our Saturday night meetings and will always be grateful for that. Business is business and my time is up. I’m excited for another fresh start. Can’t wait to see what God has next for me! One last time #FlyEaglesFly"
Smith caught 36 passes for 430 yards and two touchdowns during the regular season before adding another 13 catches for 157 yards and a touchdown in the playoffs.